It's been an eventful last few weeks as things are progressing quickly on all fronts. Last week we met with an impressive Public Relations firm in Manhattan with extensive experience in the outdoor/surf industries. We presented our business plan and much of our current branding and marketing concepts to them, and are awaiting their proposal. They've done some excellent work for REI, KSwiss, Tom's Shoes, among other clients. We've spent some critical time trying to assess our needs from that end, and how we should approach it. It was a big help to sit down with them and hear the types of benefits their work would offer us. The following day we headed out to the facility that's creating our Point of Placement materials. 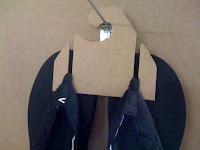 Traditionally, sandals are held on hangers, which are placed on wireframe metal racks. This is what consumers see upon entering most surf and outdoor shops. As we've mentioned before, we're using this facility to explore the option of using corrugated cardboard to create our "rack". They presented us with a very rough model of the actual structure. Although there were clearly some serious initial problems from an engineering standpoint, we were encouraged by the progress and the designers have come around from their initial thoughts that a corrugated piece wouldn't be able to support the weight of an entire line of sandals. We analyzed each area of the structure, marked up the prototype, and will head back in another week or two to view all these changes. Looking forward to that. This initial concept was pretty rough and this next round should start to give us a much better idea of the potential finished product. We've been in meetings all week here in Geneva and this has been our first opportunity to be in the same room together and sort through some of the business-oriented details we hadn't yet addressed. We got back into the proposed site for our factory and were able to get some real measurements and assess where we are with the building. We've met with the majority of the local banks to present our business plan and get as much feedback as possible. It's clearly a difficult time to be out seeking financing, but the local banks had strong interest. We were also able to meet with a grant-writer and some of the other members of Geneva's business development team to continue to discuss our proposals and gain further feedback. In all, some very encouraging prospects on that front. Busy times here at the ranch. I love love love that you use a recycled material to display your product. Many companies claim green, but then the product comes with so much plastic packaging! Thanks for thinking it all the way through!